You can’t take away the fact that at nearly 80 years of age, Tommy Steele still has the enthusiasm and vigour to go out and perform - you can see it in those twinkly blue eyes. You can sense that there’s nothing that Britain’s first teen idol and rock and roll star loves more than to perform to an admiring audience; something he certainly wasn’t short of at the Cliffs Pavilion, Southend-on-Sea on press night. In fact, when you look at him, those of us who may be too young to remember Tommy Steele in his heyday, could easily imagine him in his ‘Teddy Boy’ clobber, making the girls scream with songs like “Singing the Blues” as well as “Little White Bull” and “Flash Bang Wallop” from the film Half a Sixpence in which Steele was the star. What you can’t escape to notice, however, is that at 79 years old, Steele is nearly 40 years older than Glenn Miller was when he tragically went missing, after the flight he was on disappeared, never reaching its destination in France in 1944. Despite Steele himself insisting that he was too old for the part, producer and friend, Bill Kenwright was determined that he should take it. Being a life-long fan of Miller’s music, it didn’t take Steele too long to be persuaded to do it. Glenn Miller’s story is a short but fascinating one. Only just in his prime after putting his band together and creating history with tunes such as “In the Mood” and “Chattanooga Choo Choo”, Miller was gaining a huge amount of popularity, not only in his native USA but subsequently in the UK too. The Glenn Miller Story, is a sweet and simple musical reconstruction of the musician’s fateful life, filled with his music and songs. Songs that, even if you’re not a fan, you will instantly recognise and find yourself singing or humming along to. Miller was the man who invented the ‘swing’ band, creating a new sound put together with an unusual combination of instruments. He had the melody played on a clarinet, supported by a tenor saxophone and underpinned by harmonies from three further saxophones. This combination was enough to make people really step back and listen to his music during the 1930s. 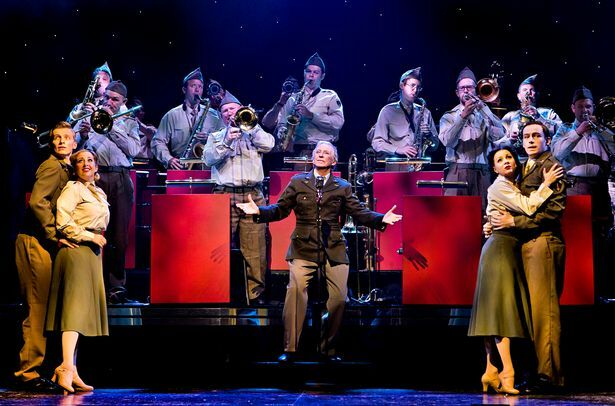 With simple but extremely effective staging, combined with a hugely talented ensemble, all of whom show off their singing and dancing skills during some lovely numbers, The Glenn Miller Story ambles along at a steady rhythm, highlighting key moments in the musician's life. Fans of Tommy Steele will of course love it; fans of Glenn Miller will, no doubt, adore it; fans of musicals however, well, they probably won’t be quite so easily impressed. Nowhere in the programme can I see who in fact wrote this musical although it has been directed by Bill Kenwright and Bob Tomson. The score clearly speaks for itself but it has to be said that the dialogue is, in places, a little on the cheesy side. For instance, in Act 2 when Miller is put on the spot to put a band together at short notice he exclaims, “Oh God,” to which his pal, Chummy responds, “He’s on harp - who’s next!” That was one of the funnier lines. Choreography by Bill Deamer is spot on with some fabulous routines, particularly in “Sing Sing Sing” which we were lucky enough to have a reprise of for an encore. Tommy Steele actually starts the show off as himself, introducing us to the cast as the Glenn Miller Fan Club. The story is then played out with Steele playing the role of Miller. In essence this would work really well but for one nagging problem - Steele is clearly too old for the part. Scenes where he meets his wife, Helen, and subsequent scenes which portray the development of their relationship somehow don’t quite sit right and I felt myself squirming somewhat during “The Nearness of You” which Miller sings to Helen before his departure into the army as war is declared. Helen is played by Abigail Jaye, who delivers beautifully ‘Moonlight Serenade” and “At Last” but is blatantly young enough to be Steele’s granddaughter and I’m afraid that no amount of artistic licence could make me think otherwise. There were some lovely characterisations amongst the ensemble with Siobhan Diffin showing off her New York telephone operator role with some nice little comedic touches. Likewise with Robert Pearce, Mike Lloyd, Chris Bone and Harry Myers who all take parts, as well as playing instruments in the band. The band is what it’s all about though and when they strike up at the end of Act 1 you would be hard pushed not to feel a few goosebumps at the haunting melody of Moonlight Serenade . I also loved the air-raid scene, for which Miller is famed for carrying on playing despite the risk of being bombed, with some rather realistic sound effects creating the feeling that the audience were also part of the drama. 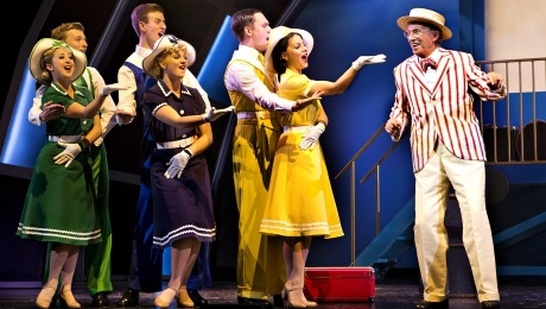 This show is a lovely tribute to Glenn Miller and his band and Tommy Steele looks to be having the time of his life up on the stage, which is quite obviously a second home to him, and it was great to see him having some banter with the audience and joking with the band after the curtain call. 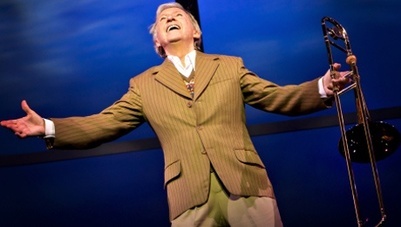 With a final rendition of “Sing Sing Sing” clearly delighting the audience Tommy Steele departed the stage to a standing ovation and the words, “I love you Southend!” I have no doubt that the feeling is mutual. We meet up with a couple who were “In the Mood” for a night out. Ivor Champion, 66, and his fiancée Wendy Harrison, 52, are huge Glenn Miller fans and can be frequently seen at any concert or show that involves Glen Miller. 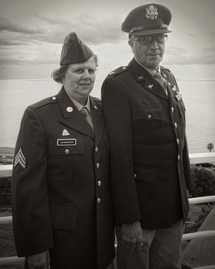 ​“We’ve been to about 3 or 4 this year,” Ivor, who is dressed in the colonel’s uniform of the 82nd Airborne, tells me.